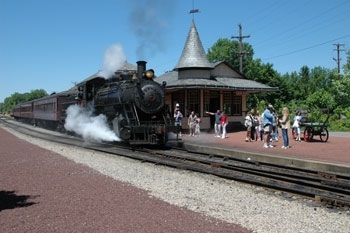 Climb aboard the New Hope and Ivyland's passenger train and travel into a scene from the past. Relax and leave your cares behind as you travel aboard our restored passenger cars. Your train will be pulled by one of our authentic steam locomotives or vintage diesels. As you travel through the rolling hills and valleys of Bucks County, experience all the sounds and romance of the "Golden Steam Era." Enjoy these 50-minute narrated rides through scenic Bucks County.